Mistake No. 1: A healthy police oversight system contains two components missing from the UOPD model — a civilian review that has some teeth to it, and a professional independent auditing body. We’ve seen that a body of community members is being recommended to review certain allegations at the UO, but this is inadequate. They are advisory only and have no authority. Our understanding is that only one person outside the UOPD, an administrative vice president, a position not expected to have experience administering a police department, has the authority to make changes or require additional investigation. Mistake No. 2: Certainly it is not a good sign that there have already been UOPD misconduct cases under their watch that have already been overturned. Seeing the UOPD’s response to the “bowl of expletives” controversy — in which officers maintained a supposedly humorous list of enemies — didn’t give us much faith that they would be able to police themselves, as the underlying message seemed to be that boys will be boys. A professional, independent auditor is the way to make sure that allegations of misconduct are properly investigated. Having an effective oversight system is not difficult at all for the city of Eugene, so why is it so challenging for UOPD? Mistake No. 3: Of greatest concern is the question of why this wasn’t all sorted out before the department bought guns and was granted the authority to use them. The rush to become a police department before analyzing the new use of force policies in place (which were literally cut and pasted from a California policy company handbook) creates liability for the UO. “The ASUO currently has no say in either UOPD policy or its internal reviews. We welcome the opportunity to participate meaningfully in police oversight and transparency issues on and off campus,” Schlegel said. 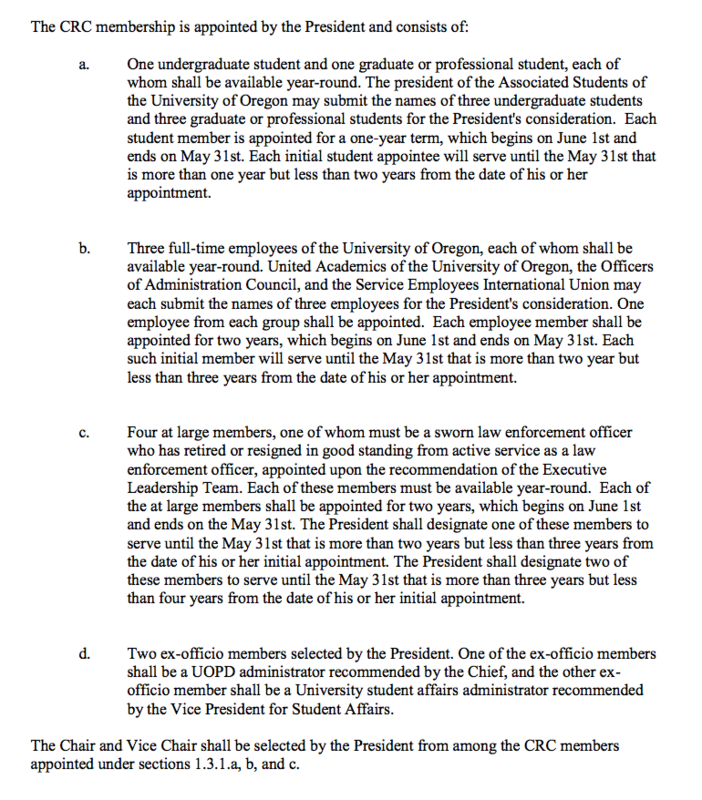 The University of Oregon has received your public records request for “copies of any ‘minutes, agendas, reports, and correspondence’ involving ‘boards and councils that function in an advisory capacity, standing and ad hoc committees and councils’ that primarily involve the UOPD. This request covers the period from 1/1/2011 to the present” on 06/24/2015, attached. The office has at least some documents responsive to your request. By this email, the office is providing you with an estimate to respond to your requests. The office estimates the actual cost of responding to your request to be $1,660.68. Upon receipt of a check made payable to the University of Oregon for that amount, the office will proceed to locate, copy, and provide the records you have requested that are not exempt from disclosure. Your check may be sent to the attention of Office of Public Records, 6207 University of Oregon, Eugene, OR 97403-6207. So, state law requires the university to retain these records – some of them in the UO archives, permanently. But UO wants to charge $1,660.68 for people to see them, and doesn’t think there’s a public interest in waiving the fee. Must be some interesting stuff hidden away there. I guess the next step is to ask the UO Archives for them, on a zip drive. To my regret this does not come as a surprise, given all the deception that has surrounded this process from the beginning. It is not encouraging that the New Pres is taking such a passive approach, does he still think he is living Chicago? or in need of protection in Holmby Hills? The charge to Public Safety needs to be reviewed, so too the budget and the division of responsibilities with the Eugene Police Dept. My preference is well known: focus on the campus, build confidence among the constituents, remove weapons, walk a beat, talk to people, visit departments, etc. It makes me cringe every time I see that the VP for Student Affairs/Life has any input on important decision making processes. This person cannot be trusted so why would anyone think that having her participation in this process would be on the up and up? No locals? These are armed cops who venture out beyond campus. I live between N. Bertelsen and Hwy. 99 and have seen UOPD out here. God knows what for. I’m not sure how I’d react if they came around wanting something. What are their limits? I’d like to know. Their behavior has been poor at best since inception. Document that with a picture and report it to the Eugene Police Dept – because that is definitely not allowed (especially as armed), unless the UOPD definition of “campus” is very loose …. Any certified police officer in Oregon can enforce anywhere in the state. Policy may prevent that for some agencies, but the law doesn’t. Maybe they were contacting someone about a crime that happened on campus? I’ve seen them down around Chambers and 6th, also. Trouble is being in my car limits getting a photo. And they may be able to enforce law anywhere. I would just like to know what the hell is pulling them away from campus. I looked for a dispatch log like EPD has and there’s nothing. If it’s not transparent from the start it never will be.